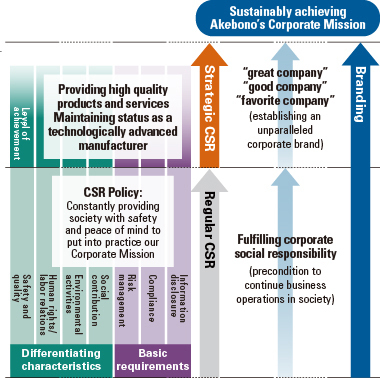 Initiatives to Raise Corporate Value | CSR Policy | Corporate Social Responsibility (CSR) | Akebono Brake Industry Co., Ltd. In 2005, Akebono initiated corporate brand management, an initiative aimed at enhancing corporate value by meeting the expectations of stakeholders, namely, customers, shareholders and associates, with an equal emphasis placed on each of these key stakeholder groups. In October 2005, Akebono went on to formulate the Brand Statement, implementing the full-scale launch of its corporate brand management initiative with the aim of encouraging pride in the Akebono brand among associates and thereby strengthening the Company’s competitive edge. Akebono considers fulfilling its corporate social responsibility (CSR) to be indispensable to continued business operations. In other words, its pursuit of regular CSR activities is an essential part of maintaining its operating foundation. At the same time, corporate branding initiatives reflect the Company’s strategic CSR initiative aimed at further enhancing its social and corporate value. To realize our Corporate Mission, we will promote corporate branding initiatives to secure greater corporate strength, remaining a company that consistently provides people with safety and peace of mind through its operations. Akebono conducts its own annual surveys on corporate brand awareness in order to effectively put into practice corporate brand management. These surveys have been conducted every year since 2005, when corporate brand management was introduced, as they are an essential part of the Plan, Do, Check and Act (PDCA) cycle that drives our branding promotion activities. Recently, the scope of the survey was expanded to include a wide range of our domestic and overseas business locations, such as customers and suppliers in each field. In fiscal 2017, we again conducted a survey of all our bases in Japan, North America, Europe and Asia. The number of respondents totaled 6,356. In the fiscal 2017 survey, the questions on the survey form were substantially changed to make them more concise and specific so that the current state of Akebono’s strengths and challenges could be highlighted. There were concerns that associates' impressions of Akebono’s technical capabilities had declined year by year. The survey score shows that their impressions have now taken an upward turn, confirming the effect of series of activities including the “Branding Activities 2017 akebono Technology Fest.” held in September 2017. By holding tours of the Technology Fest. at each manufacturing plant, we seek to proactively create opportunities to expose direct and indirect employees to our technology in fiscal 2018. Because the business unit (BU) system will begin full operation in fiscal 2018, we will continue to conduct the corporate brand awareness survey on impressions from inside and outside of Akebono associated with changes in the organization and personnel. We steadily undertake countermeasures based on the results in order to raise associates’ awareness and thereby improve quality in all aspects of operations. Akebono is contributing to the creation of a safer, more secure society from various perspectives, identifying social needs and working to provide solutions through its business. In particular, we are focused on developing next-generation technologies such as products that are easy on people and the environment. We will also work to enhance our corporate value by developing the Infrastructure & Mobility business for supporting urban development and people’s everyday lives.